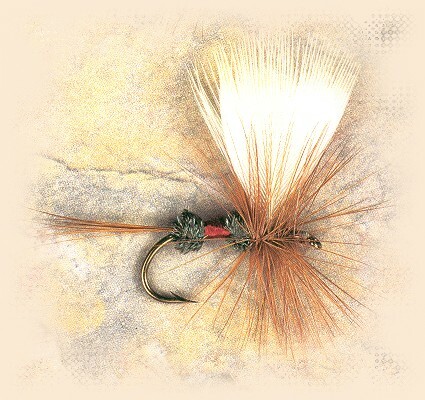 "Royal Coachman, Fan Wing - Old Flies - Fly Angler's OnLine Volumn 6 week 11"
The latest version of the Royal Coachman may well be Lee Wulff's Royal Wulff, which utilizes many of the segments of this fly. Hook: #10 and #12 down eye reversed. Body: Peacock herl, with center portion of dark red floss. Wing: Mandarin breast feather, set upright. Credits: Color photo and recipe from Forgotten Flies published by The Complete Sportsman.